4 Bedroom House For Sale in Tunbridge Wells for Asking Price £785,000. 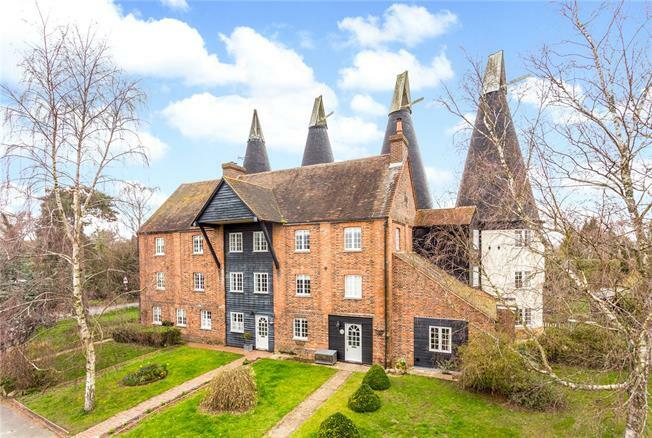 A superb Grade II Listed conversion of an oast house with spacious and flexible accommodation. On the ground floor and to the front of the property there is an excellent drawing room with a wood burning stove and some exposed timbers with space for a dining table and chairs. There is an inner hallway with cloakroom, staircase and a door which leads to the kitchen/breakfast room. Situated within the roundel, this has been very well fitted with an extensive range of floor and wall mounted units with granite work surfaces and a door opening onto the garden. On the first floor the principal bedroom is situated within the roundel which is a very good size with a double aspect and an en-suite shower room. The two further rooms on this floor are currently used as a sitting/ playroom and a study, with one leading to the other. These rooms however could quite easily be re-arranged to become two separate additional bedrooms or a bedroom with an en-suite bathroom or nursery, subject to the necessary consents. On the 2nd floor there is the family bathroom along with the three further bedrooms, one of which is positioned within the roundel. The property is situated in the highly regarded village of Lamberhurst and is within easy walking distance of its local shop and Post Office, primary school, pubs, and Scotney Castle. Lamberhurst Golf Club is close-by as is Bedgebury Pinetum and Bewl Water with its various water-sports and activities. Tunbridge Wells is about 6 miles away for comprehensive shopping facilities and recreational amenities and the A21 is just to the north for a direct route to the M25. The nearest railways stations can be found at Frant (4 miles) and Wadhurst (4.5 miles) and Tunbridge Wells (6 miles). These provide a fast and regular service to London Bridge, London Waterloo East, London Charing Cross and Cannon Street. To the front of the property there is a pretty garden with a pathway leading to the front door. To the rear, the garden is mainly laid to lawn with a terrace adjoining the house and a lovely summerhouse amongst a selection of mature plants, shrubs and trees. At the end there is an excellent detached double open fronted timber garage with a separate workshop and log store with parking in front. Double oak gates open onto a parking area where this property has the benefit of two parking spaces. Train Services: Frant Station at Bells Yew Green about 3.5 miles away for fast commuter trains to London (Charing Cross, London Bridge and Cannon Street) in about 1 hour.